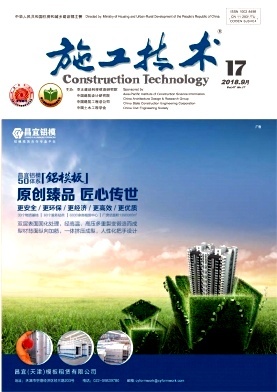 Application of Intelligent Equipment Based on BIM Technology in Construction of Hyperbolic Structures WAN Renwei;JIANG Yueju;ZHANG Dong;HAN Yang;XIAO Xiaojiao;Huajiang Construction Co.
Construction Technology of Precast Refrigerating Station Based on BIM WU Xiaojian;LI Yanqiang;AI Pengfei;LIU Yang;YANG Xinrong;China Construction Second Engineering Bureau Co. Application of BIM and AHP Method in Quota Design of EPC Project BAI Xiaohu;Shanghai Baoye Group Co. Application of BIM Technology in Reconstruction Project of a Mine in Nanjing SHI Feng;LIU Xu;CHEN Yawen;Wuhan Surveying-geotechnical Research Institute Co. Details of Segmental Archaized Components and Roof Construction Technology in Antique Reconstruction and Expansion Project DAI Bin;China Shanxi Sijian Group Co. Preparation Research of Lightweight Ceramsite Partition Board for Prefabricated Construction QI Guihai;ZHANG Xianyun;HUANG Qiaoling;PAN Peiyao;Guizhou Construction Science Research & Design Institute Co.
Study on the Bond Behavior Connected New-to-old Concrete by Shear Connector TAN Deyin;YANG Shuai;WEI Minghui;CCCC Fourth Harbor Engineering Institute Co.
Anti-floating Positioning Optimization and Detection of Cast-in-situ Concrete Hollow Floor Core Formwork YANG Xiaoqin;HOU Shaobin;AVIC CONCT Group Co.
Design and Construction of the Waterproof Project of the Underground Comprehensive Utility Tunnel in Xinjiang WU Jiling;CHEN Shujuan;DUAN Cuixia;YANG Shen;Xinjiang Construction Vocational and Technical College;Xinjiang Chengjian Hongyuan Municipal Garden Co.
Construction Technology of Tube Well Dewatering in Deep Foundation Excavation with Drift Sand Layer Adjacent to Existing Buildings SUN Guoliang;SONG Wenzhi;Shanghai Ershiye Construction Co.
Study on Deformation Law of Long Narrow Deep Soft Soil Foundation Excavation TANG Shengli;CHEN Mingjie;NIU Wenxuan;WU Guisheng;Guangzhou Nansha Pearl Bay Development Co.
Construction Optimization of Small Clearance Lay-loess Tunnel Based on Numerical Simulation Analysis YU Chunhong;China Railway Construction Bridge Engineering Bureau Group Co.
Window-to-window into the Formwork Technical Research of Expressway Tunnel Secondary Lining Concrete LIN Xinlei;CHEN Yong;CCCC First Highway Two Engineering Co.
Study on Closure Sequences of Multi-span Corrugated Steel Webs Continuous Rigid Frame Bridge YOU Jialin;CHEN Cheng;WU Di;LI Qin;CCCC Second Harbour Engineering Co. Application Research on UAV Tilting Photography Assistant BIM + GIS Technology in Urban Rail Transit Construction CHENG Yongzhi;MA Qiang;ZHANG Leigang;CCCC SHEC Third Highway Engineering Co.
Research on Charging Infrastructure Planning for Electric Vehicles in Airport Flight Area YE Min;Shanghai CAAC New Era Airport Design & Research Institute Co.